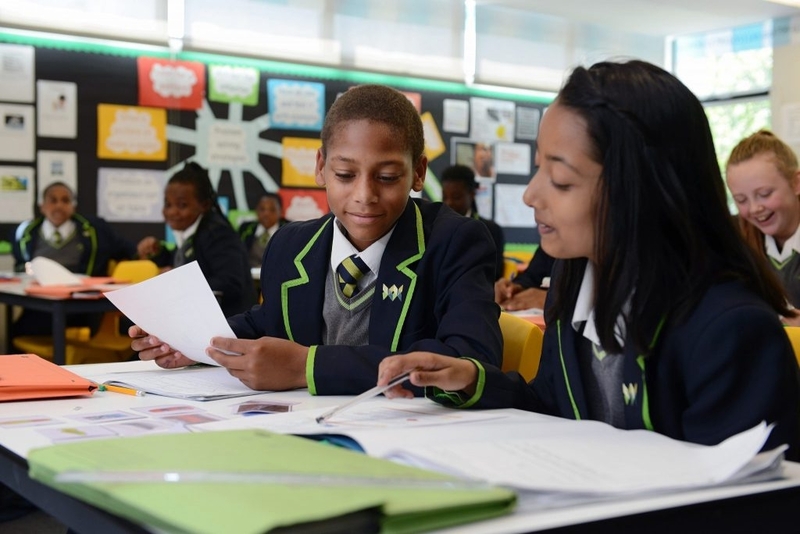 If you have unanswered questions about joining Haggerston School, please click here to visit our Admissions and Transitions Questions page. Welcome to Haggerston School and thank you for choosing us as the secondary school for your child. We are delighted that so many new children will be joining us in September 2017 and we would like to take this opportunity to sincerely welcome you as a family. The next five academic years will be a major chapter in the life of your child and we are absolutely committed to making this period as special and purposeful as possible, maximising, where we can, the well being and life chances of all the young people within our care. The journey we take with your child begins now. There is much that we can do now to prepare the way, both practically and emotionally, so that your child will find the transition from primary school to secondary school as exciting and stress free as possible. This page will outline some of the opportunities that we offer you as a family and we hope that you will feel able to contact us if there is anything that worries or concerns you in the coming months. It is extremely important that we become familiar faces in the life of your child over the next few months and there will be a number of important opportunities for us to meet your children, both within their own school setting, but also when we invite them, and you, to join us at Haggerston School. These dates are outlined below. Staff from Haggerston School will be visiting almost every child in their Primary/Junior School from mid-June to meet the children and to answer any questions about the transition process and life at secondary school. Haggerston School has a good relationship with its feeder Primary schools and many of the children starting in September will have already attended enrichment activities at our school over the past year. On Thursday 6th July 2017 your child will attend Haggerston School for the full day to experience school life, meet their new form tutor and fellow tutees. We provide a lunch on that day. Don’t forget to send your child with a pencil case and a bottle of water. The transition team will contact you again nearer the date to confirm some logistical information. There will be an evening meeting on 6th July 2017 which you are invited to attend. Here you will have the opportunity to meet some of the key Haggerston School staff who will be working with your child. You will also hear short presentations from the Headteacher, Deputy Headteachers and other senior staff. It is also an opportunity to raise any specific concerns you may have about your child’s transition to secondary school. The meeting starts at 5.00pm and ends at 6.30pm. It is not a drop in session, and it is recommended that you are here for the duration of the evening to ensure you receive all the information. We hope that you appreciate the importance of this evening and are able to attend. Children do not need to attend this evening. If you are a parent/carer with a child who has special educational needs then you will be invited to attend a coffee morning on 3rd July where you will bring your child to Haggerston School and meet staff from the Inclusion Department. During the morning the children will be able to experience some of the activities on offer within the school, whilst you have an opportunity to talk to the staff who will be supporting your child from September. Please note this session is by invitation only, and you will be contacted individually by the Inclusion team. Students who attend the coffee morning are also expected to attend the induction day on 6th July. Year 7 students will start school on Tuesday 5th September at 08.40am. School will be open to year 7, 11 and 12 only. All year 7 students are expected to attend, the school has high expectations regarding attendance and the first day of secondary school is a very special day in your child’s education. Parents/carers will in the coming months (mid May) be receiving an admissions welcome letter. Enclosed with your admissions letter will be a contact details form for you to complete and return. Please could you complete and return to us in the stamped addressed envelope provided. It would be helpful if you could return the form to us no later than Friday 16th June 2017. It is important that the school has all the correct contact details, as without this it might result in you not receiving important information about your child starting school. If you are not clear about any of the details or dates please do not hesitate to contact the transition team on the number below or email: transition@haggerston.hackney.sch.uk. You can apply from May onwards after you receive the secondary school offer letter from the Learning Trust’s Admissions Team. Your application will normally be processed in May/June. The grant is £100 Clothing vouchers which can be exchanged for school uniform at London shops that take part in the scheme. A list of shops will be sent to you with the confirmation letter telling you when to collect your vouchers. If your child currently gets free school meals at a Hackney school, you do not need to attach any proof of benefit. and return the form to Pupil Benefits, Hackney Learning Trust, 1 Reading Lane, London, E8 1GQ. Child Tax Credit, provided you are not entitled to Working Tax Credit and your income is £16,190 or less (this figure changes each April). Asylum seekers need to provide their IND Letter or IND Card, social services letter or their NASS letter in order to qualify for free school meals. Valuing and nurturing your son/daughter, respecting their background and supporting his/her individual learning needs. Striving for excellence by setting the highest standards and highest expectations so that your son/daughter has the opportunity to succeed at school and beyond. Tracking your son/daughter’s learning and progress and keeping you informed at regular intervals. Offering opportunities for you to become involved in the life and learning of the school. Celebrating your son/daughter’s success and that of the school. Attending Parent’s evening and discussions about your son/daughter’s progress. Seeing that your son/daughter goes to school regularly, on time, in correct uniform and properly equipped. Supporting the school’s policies and guidelines for learning and behaviour. Supporting your son/daughter in homework and other learning opportunities. Checking and signing the diary each week to ensure that homework is completed. Come to school each day on time. Bring all their equipment every day. Wear the correct uniform to and from school and follow all the uniform rules. Complete their class work and homework as well as they can. Be polite and respectful to all staff and students. Strive to achieve certificates and rewards. Attend detentions and appointments with staff on time. Follow the code of conduct of the school.